6.7L Power Stroke Engine and Drivetrain Discussion of the 6.7L Power Stroke diesel engine and drivetrain in the 2011-Up Super Duty trucks. No gas engine discussion allowed except on transmissions and drivetrain that pertain to all models. Please confine discussion of topics in this forum to those items that are specific to the 6.7L Power Stroke engine. Started noticing good sized coolant spots under my truck. Spots are 3” in diameter right underneath the front driver side near the bumper. Almost seems to be coming out of the bottom radiator drain hole but I see no signs of coolant coming from there. It only happens after driving for a bit and shutting it down. Any ideas? sounds like the typical radiator leak that seems to occur on the trucks. 2015 F350 Ultra Lariat 6.7L CCLB DRW 3.73 Limited Slip, Green Gem Metallic w/ Caribou accent, Camper Package, Titan 65gal tank, Rapid Heat, Block Heater, Upfitter Switches, Dual Alternators, Camper Package, Cable Lock, Husky Floor Liners, Spray in Bedliner, 5th Wheel Prep, 25K 5th Wheel Hitch, Ford Goose Neck Hitch. I don’t know much about the leaks. I’m coming from a 7.3 so all I know is cps and glow plug problems lol. 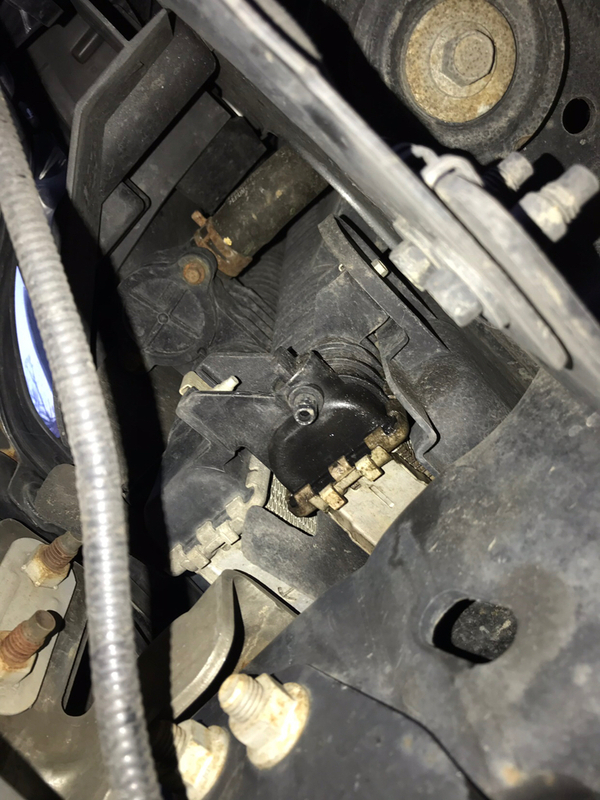 This is looking from below the driver side at the radiator drain plug. If it is a radiator leak, can I just add coolant at a 50/50 mix to the reservoir to keep it at normal level until I can save up to have it replaced? I would clean it off with some hot soapy water and garden hose if possible and make sure that is where the leak is coming from (it does look like a typical radiator leak but you never know). I would not add any kind of stop leak to the system. Keep it toped off and check the leak every day you should be fine. Don't let someone else drive it or it will go catastrophic for sure. Stick a few gallons of water in the bed in case it starts to leak bad while on the road. 7.3 radiator swap is easy, I have not worked on a 6.7.